Aloha. The Hawaii Republican Assembly is passing along warnings received from friends statewide to Republicans and conservatives in the Aloha State. You can help stop bad ideas from becoming law and stop bad politicians from holding office by taking action today. 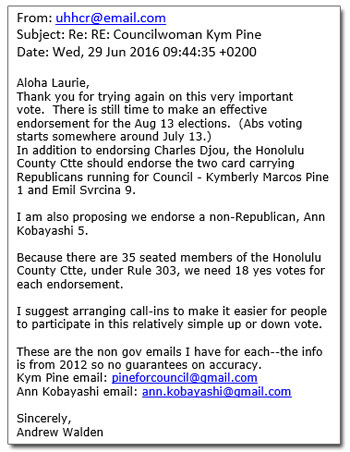 HIRA has warned everyone for years about fake Republican and self-aggrandizing opportunist Charles RINO Djou. Today, the official founder of HART and the champion of wasting tens of billions of your dollars on the heavy rail boondoggle penned an op-ed for the liberal website Civil Beat explaining why he now joins Beth Fukumoto Chang, Aaron "Ling" Johanson and Kym Pine Ryglowski as a skidmark on the side of the RINO highway. 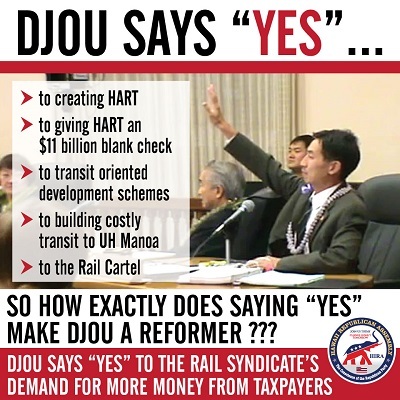 HIRA warned you about fake Republicans like Aaron "Ling" Johanson, Beth Fukumoto Chang, Kym Pine Ryglowski, and Charles Djou even while the RINO leadership of the Hawaii GOP vouched for them. Now, these phony balonies are all gone. 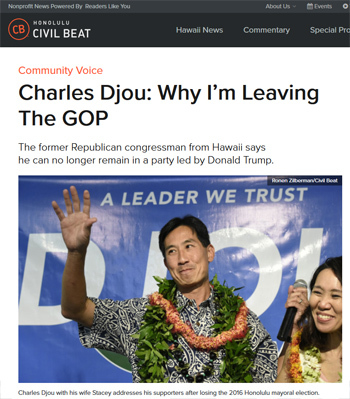 Believe it or not, this guy Charles Djou was endorsed in 2016 by the local Republican Party at the urging of Andrew Walden, the editor of the fake conservative website "Hawaii Free Press" and Shirlene Ostrov's current chairman of the Hawaii GOP rules committee. Walden stormed out of a meeting of the Honolulu GOP county committee when they refused to endorse Djou and Kym Pine, both of whom are now former Republicans. They had to hold a 2nd meeting where Walden finally got his nutty liberal wish. Yes, progressive, tax-n-spend, big government idiots wearing blinders continue to run the Hawaii GOP. BE WARNED: Today, party leaders are vouching for (and pulling for) Andria Tupola, who votes 90% of the time with Democrats. HIRA warns you again that Democrats control the Hawaii GOP and are keeping conservatives (a.k.a. REAL Republicans) from having any voice whatsoever in Hawaii politics. You won't be missed, Chuck. While laughingly comparing yourself to Winston Churchill, don't let the door whack you in the okole on the way out. In fact, take fake Republican Andria Tupola with you - she's your kind of GOPer who votes with Democrats 90% of the time. Auwe!